Last week UFC President Dana White told TMZ that the UFC has offered Nate Diaz several fights since his second outing with Conor McGregor last summer. “We keep offering Nate fights, and he keeps turning them down,” White told TMZ. “Nick too,” White continue, meaning Nate’s older brother who also has been absent from the octagon even after his suspension was lifted. Nate dropped a majority decision to McGregor in August at UFC 202, a rematch from their UFC 196 headliner in which Diaz submitted the Irisman. 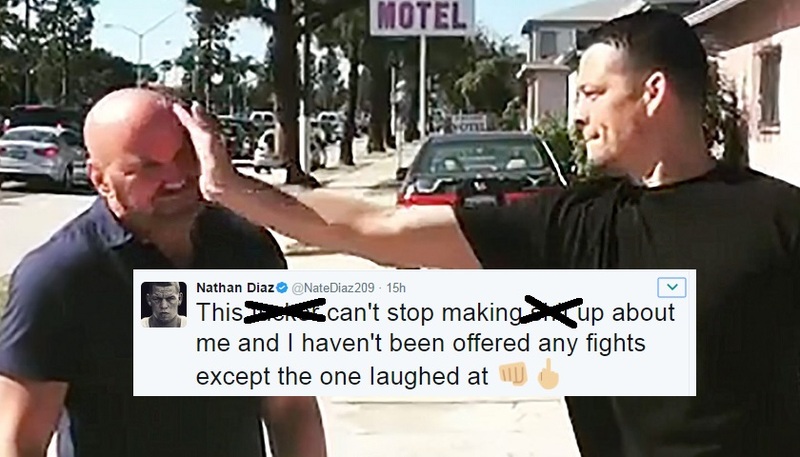 Since then, Diaz has been virtually absent after receiving his largest pay day to date. It appears that Diaz would like to pursue a trilogy bout with McGregor, however, the UFC lightweight champion is currently seeking a boxing match with Floyd Mayweather Jr.
Last night Diaz tweeted out a response to White’s claims. After earning $2 million for the McGregor rematch, Diaz told MMAFighting in December that he won’t answer UFC calls for less than $20 million a fight. Will we see Nate Diaz compete back in the UFC octagon, and if so, against who?